Andrew graduated from Hyles-Anderson College with a bachelor of science degree in pastoral theology. After serving on the staff at a Christian college for seven years, he and his family moved to Ghana, West Africa, to plant a church where he had his first role in children’s ministry. 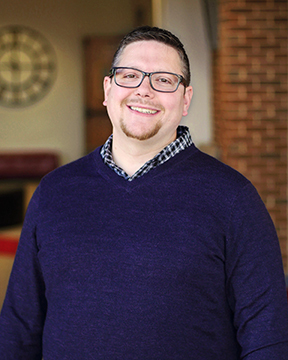 Before he joined the FBCO staff in 2018, Andrew served in churches in Hammond, Indiana, and Griffith, Indiana, as a minister to children. Andrew enjoys outreach in the local schools and community, in addition to implementing programs to meet the needs of families. Andrew is married to Jessica and they have seven children. He enjoys riding his bike, reading, taking Jessica to Broadway musicals, and watching movies with his family.